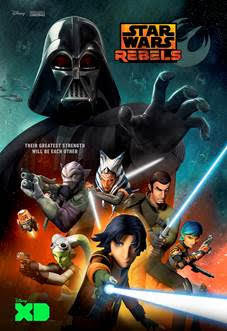 To be honest, after "Clone Wars" was pulled from Cartoon Network after Disney bought out Lucas, I was not too hip on any new animated series from this franchise. I watched the first few episodes begrudgingly and then found myself surprised to be getting into the story line. Then suddenly I found myself looking forward to each new episode. So yes, it is different, but just as good as "Clone Wars" was over on Cartoon Network. "The Rebels return to Lothal to save a defecting Imperial officer, only to draw the attention of the Empire’s most dreaded agent - Darth Vader. The highly anticipated "Star Wars Rebels" season two is set to premiere on SATURDAY, JUNE 20 (9:00 p.m., ET/PT) on Disney XD. The season will kick-off with a special one-hour movie event "Star Wars Rebels: The Siege of Lothal." Following the one-hour movie event, the season will continue to rollout new episodes in the fall."